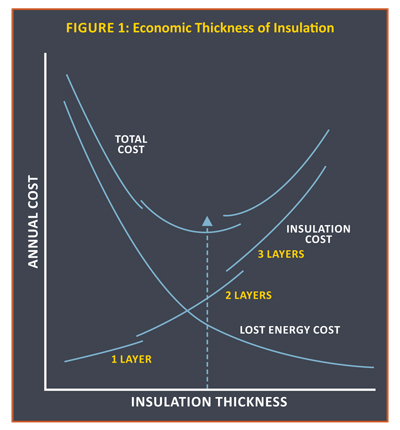 account for each insulation system. reduce heating and cooling loads, and to control noise in building envelopes. following design objectives (answering the question: why insulate?). attention when designing a mechanical insulation system. required for all but the simplest projects. and 2) minimizing or managing water vapor intrusion. spaces, care must still be exercised when selecting the design conditions. Often, the HVAC system will be sized to provide indoor conditions of 75°F/50% RH on a design summer day. for piping and equipment that is operating at below ambient temperatures. water vapor, and leakage of surface water. in the insulation system but at a rate designed to prevent harmful effects. must ensure adequate expulsion of the accumulation. passage of water vapor is eliminated or minimized to an insignificant level. defense for these moisture sources. role in national security and the economy. code organizations and/or various jurisdictions as building energy codes. rate of return, and 6) annual CO2 emissions. systems are frequently designed with the objective of minimizing costs. time value of money, inflation, and taxes. and material) of the insulation increase with thickness. is in the double-layer range. total cost up to a thickness where the change in total cost is equal to zero. savings associated with the ability to specify lower capacity equipment. therefore should consider the economic thickness of insulation to be a minimum. equipment, which also contributes to sustainability. more recent International Code Council (International Codes). Fire-resistance ratings often are developed using ASTM E119. 1,700°F at 1 h, and 2,300°F at 8 h.
in terms of flame-spread and smoke-developed indices. flame penetration and low-energy ignition) as part of the listing requirements. prevent freezing if flow is maintained at a sufficient rate. design for longer contact times (i.e., lower surface temperatures). blisters skin more severely than a nonmetallic jacket at equal contact time. capacity of process heating and/or cooling equipment. negative sign, which indicates a temperature rise in the fluid stream. vinyl (MFV) in combination with aluminum. insertion loss number, the larger the amount of noise reduction. acoustical treatment, beginning with the largest source. room to another through the ducts. when directly applied to the duct surface.